Leak-checked the fuel tank, where the number of leaks shall not be mention! 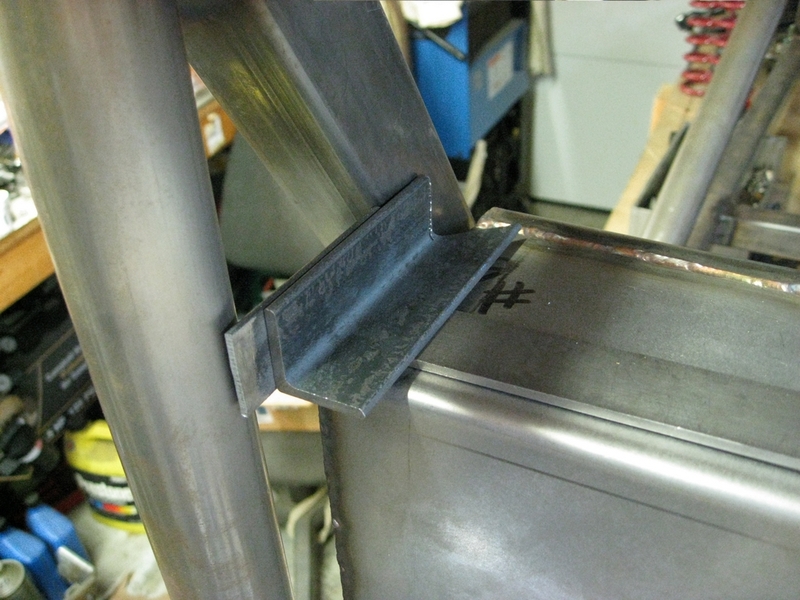 Welded in the upper tank mounts, which reminds me of something someone asked; the upper mounts do not rigidly attach to the tank. They simply hold it down in the support tray. The chassis tubes already do a good job at containing it. Finished up the tray, installed the right hardware, sat the tank on it, and there we go. With the tank in-place it means work on electrical and paneling can push forward. In other news, I tried ordering tires, but my local – and preferred – tire guy says they’re back-ordered. Eh, no problem, they can wait a while. It won’t be until the electrical’s done that I’ll get itchy for them. The transaxle’s supposed to arrive tomorrow, though it needs a slight modification. When they did the work, I requested that while they were in there to go ahead and install a lower ratio TSX 6th gear. Somewhere along the line the message got confused; what I sent was a 5-sp, what I’m getting back is a 6-sp! It’s not a big deal but it’s a reminder about how important communications is and how easy things get confused if not spelled out… It’s at least as much my fault as theirs. Just read that Sir Stirling Moss stepped into an elevator… only it wasn’t there! The 80-yr old ex-race car driver fell 40-ft to the bottom of the shaft and broke a bunch of bones, but is alive and recovering in the hospital. I’d have thought it was a poor joke had I heard it through different channels. I wish him a full recovery. 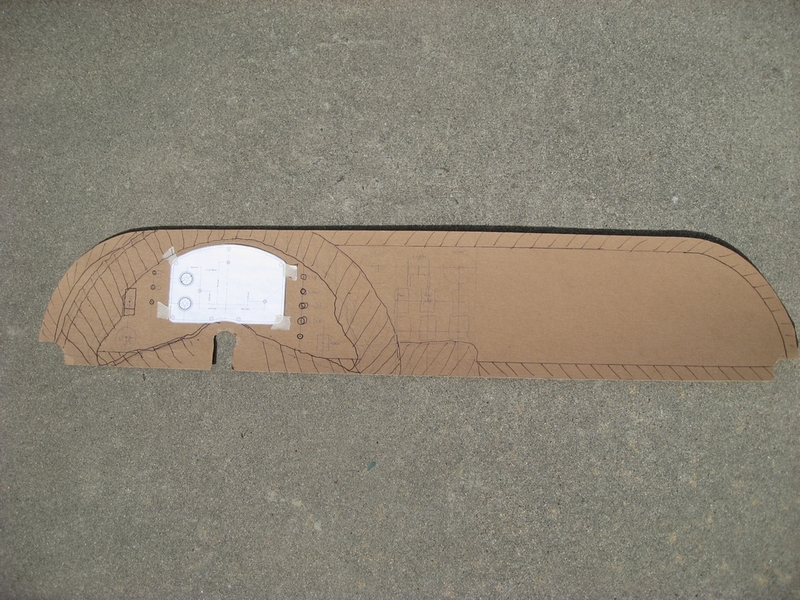 The plan was to use straps to keep the tank from rising upward or tipping forward. 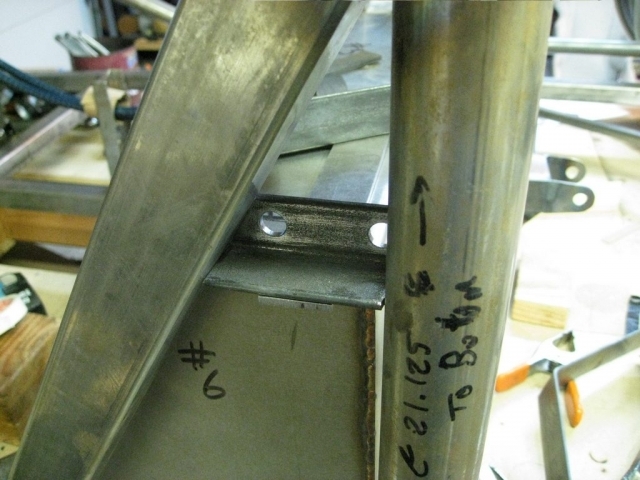 That was well along, with the straps half-way completed before it sank in that far more efficient are simple – and strong – brackets on the ends. These will work as well as the straps, weigh less, and make it easier to install the tank. The concern was that lifting the tank up against fixed straps would be really awkward. 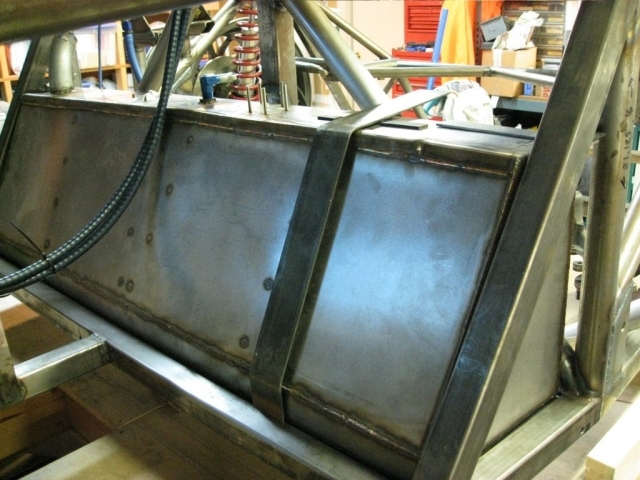 This way the tank is easily installed, then clamped into position. There may be a third bracket in the center if framework ends up in that area as part of the emergency brake solution. Might make sense to leak-check the tank soon. going got tough.) It’s all mental – nothing here is hard, but it’s facing my various little goofs and having to back up and fix them that makes it tough. Redoing things has a way of sucking the week’s enthusiasm out of what’s supposed to be fun work sessions. After it’s done, instead of feeling good it’s feeling relief. thought out. It had a total of one construction goof while Midlana’s already up to half a dozen. They’re all worked out, but it comes at the expense of time. frame may shift and rip open the tank if it’s hard-mounted. well once I got my head on straight. A few builders expressed concern about it being hard to remove but it’s a non-issue. I don’t really understand the concern though since the tank will hardly ever have to come out. Kimini’s tank never needed removal, which was a good thing because it was about 10 time harder to get at than Midlana’s. See, I did learn something! Worked on the dash mid-week, which is done other than adding an accessory outlet which is on the way. Instead of working in the garage, spent time on this beautiful day doing family stuff. Yesterday was spent replacing the garage door opener. I don’t know what’s with these things, but this is the third unit that’s failed the same way: the “collision/reverse” feature goes bad and it starts backing up for no reason at all. No, the light beams are working fine and show “green” the entire time. The odd thing is that of three different models and makes, they all failed the same way. 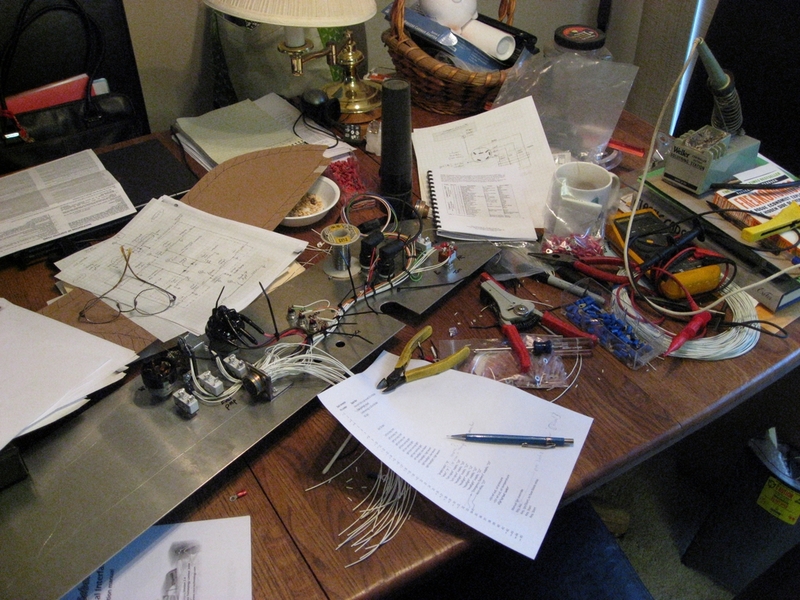 This afternoon, worked on the book which has been languishing, creating drawings for the front rocker assembly. 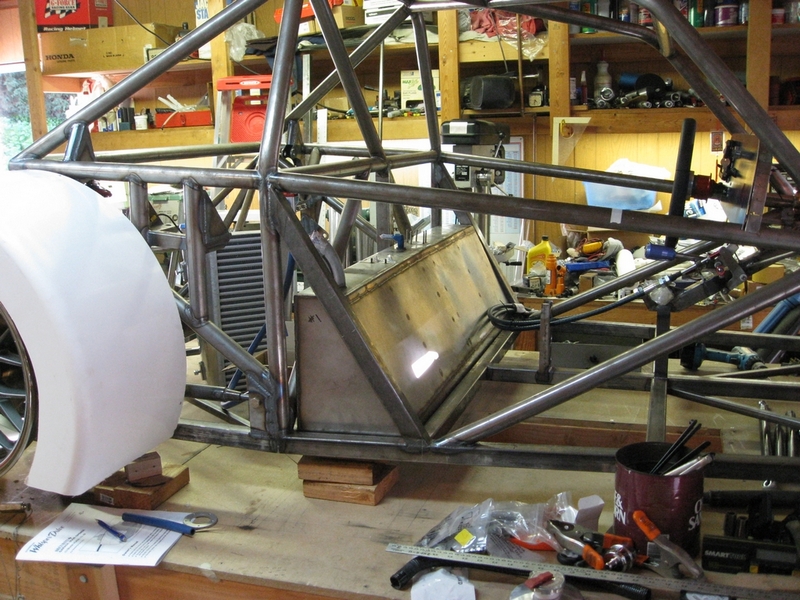 That’s nearly done and after making related changes to the chassis, it’ll be up to date – finally! Next weekend’s plan is to make the fuel tank cradle. In order to move forward on the wiring, the tank needs to be in place since everything has to go up and over it, including wires, cables, coolant lines, and emergency brake. Instead of spending the day in a cold garage, wired the dash on the kitchen table (as was done 12 years ago with Kimini’s dash.) It’s nearly done other than a couple forgotten switches and needing to tie off all the spare (white) wires. Of course the mate to the dash connector needs wiring, adding supply lines from the fuse box, and wiring various system parameters into the data logger. What’s nice is most engine parameters are in the OBD-2 message packet, so the logger automatically reads this without needing any wires. The down side is that oil temp and oil pressure aren’t measured, so I have to add sensors. What will be a bit of a time sink is calibrating the sensors, but so it goes. are needed. There also needs to be connectors at strategic places in the harness so the entire mess, including the fuse box, doesn’t have to be pulled for service. Cut and drilled the dash, blue here due to the mark-up compound. The two empty holes are due to me forgetting two switches. The spreadsheets are done so it should be pretty straightforward to wire it but just in case, there are plenty of spare connector pins for the inevitable forgotten signals. 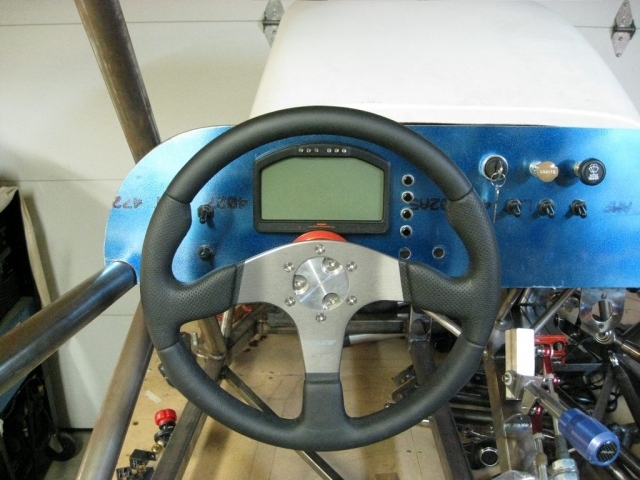 All controls are visible with the steering wheel in place, and the controls to the right are up high due to the proximity of the shifter in first and third gear. Haven’t made a decision on the fenders. This may get put off until the tires are mounted, giving a better sense what the fenders do to the overall appearance of the car. Forgot to mention that the “guess the horsepower” contest ended at the end of February; thank you to everyone who entered. The range of guesses is pretty spectacular, with a 250 hp spread! Well, guess we’ll all find out, right after I get past silly things like fenders, electrical, and paneling.